Leeks (Allium ampeloprasum var. porrum) are a vegetable with a mild onion flavor typically used in soups, quiches and casseroles. They look like giant green onions, with a long white shaft, but their leaves are flat, thick and tightly folded. In northern areas of Texas, set out your leeks as transplants in early spring for a mid-summer harvest. If you live in the southern parts of the state, seed or transplant your leeks in late summer or early fall for an early winter harvest. Texas A&M University Extension recommends the 'American Flag' variety for gardeners in the Lone Star state. Prepare your soil by putting down a 6- to 12-inch layer of compost and manure on top of your garden soil. Dig in the amendments to a depth of 12 inches. Leeks are heavy feeders, and Texas soil that is clay or very sandy needs extra nutrients. Dig a trench 1/2 inch deep in the soil. Plant eight to 10 leek seeds for every 12 inches of the trench. Cover the seeds with soil. Do not tamp the soil. Texas A&M University Extension recommends lightly mulching the seeded area with organic matter if the temperatures are high. Water daily during the first two weeks after the seedlings appear. After they are more mature, keep the soil slightly dry. Thin the leek seedlings after four to six weeks. The plants should be spaced 4 inches apart. Blanch the leeks when the stems are 1 inch in diameter. Pile dirt around the leeks, so light is blocked from the stem. This will ensure pure-white leek stems. Some Texas gardeners tie black plastic or brown wrapping paper or pile a 6-inch layer of organic matter around the stems, according to A&M horticulturalists. Harvest your leeks when the stems are at least 1 inch in diameter (although smaller varieties may mature at 1/2- to 3/4-inch diameter). Check that your leeks' shafts are firm, white and at least 3 inches long. 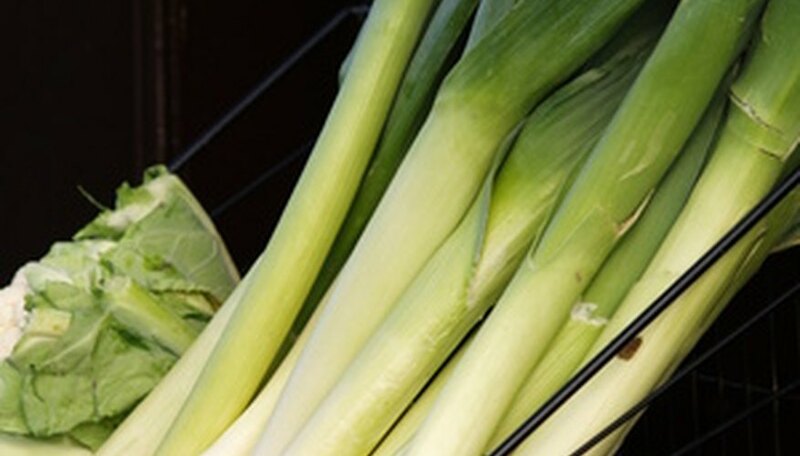 The top of the leek, known as the flag, should be dark blue-green in color. Twist or pull gently on the leeks to lift them from the soil. Before using leeks, wash them thoroughly because dirt and sand accumulate beneath their leaves. Leek tops do not die back as they mature, unlike onions and shallots. Leeks are fairly frost tolerant, with some varieties surviving in temperatures as low as 20 degrees F, according to the University of Minnesota Extension. To keep your leeks growing during an early frost, mound mulch around the plants to protect them.